Facing rapidly rising housing costs and homelessness, renters in Los Angeles formed a tenants’ organization, and, with the rhetorical support of prominent civic leaders, carried out rent strikes, shamed landlords who raised rents dramatically, and advocated for rent control. No, try almost a century earlier, in the very early 1920s, which saw the first major battle over rent control in Los Angeles. With Los Angeles again suffering from an acute housing crisis, and a measure on the ballot to remove state limits on rent control, I thought it was worth considering the past, present and potential future of rent control in LA. This essay examines the first (and short lived) time that the City of Los Angeles had rent control. political leaders seeing a justification to regulate rent levels. In the western political tradition, the philosophical case for restricting rents rested on the concept that there was a ‘just price’ for products and services, that could be different than the market price. Aristotle wrote about just prices, as did Thomas Aquinas and other scholastic thinkers in the medieval to early modern eras. It wasn’t until towards the end of this two thousand year period that the theory of a just price was applied in practice to mandate rent levels. Take the city of Rome as an example. While the majority of residents in Imperial Rome rented homes in multi-story apartment buildings (insulae), there were no limits on prices that owners could charge. There were restrictions on demotion of existing apartments which may have been intended to prevent low-income tenants from losing their homes). Starting in the 1560s, rent control with some of the features that we would recognize in modern laws was established in Rome by Popes to regulate Christian landlords renting homes to Jewish tenants. Jewish residents needed rent relief because the same Church leaders had imposed legal discrimination against Jews, preventing them from owning property and forcing them to live in just a few neighborhoods. Christian landlords renting to Jews in these ghettos were barred from raising rents, except to pass through the costs of renovations, and forbidden from evicting their tenants. Rent control was also used in France and Spain in the late Medieval/ early Modern periods. Rent control in LA: early 1920s. The first push for rent control in Los Angeles illustrates this pattern of war causing a housing crises, leading to calls to protect tenants. Housing shortages brought on by World War One, combined with ongoing population growth, caused rents in Los Angeles to spike in the late nineteen ’teens and early twenties. “scores of stories.. regarding high-handed inhumane and illegal methods adopted by landlords and real estate agents to push poor people out into the streets, post-haste, so as to make the houses and apartments available to new tenants forced, through present circumstances, to pay anything that is asked of them.” “Ask Rent Gouge Facts: Reality Board and Others Prepare to Drive Profiteers into Open.” Los Angeles Times, October 25, 1920. Pg II 1. The Chamber of Commerce published newspaper ads seeking people with “any living quarters which you would be willing to rent at reasonable rates, in order to relieve the present acute housing shortage, you are requested, as a matter of public service, to fill out the [attached form] and mail it to [us].” [“Living Quarters to Rent” advertisement. Los Angeles Times, November 5, 1920. pg. II 1.] The city’s Realty Board established a rent gouging committee, with meetings open to public and press, to give tenants an opportunity to “appear in person and lay the facts before the investigators. Landlords, too, will be given every chance to explain why the rents were raised.” [“Ask Rent Gouge Facts, ibid]. Around the same time that business interests were singling out individual rent-gouging landlords, the Los Angeles Tenants’ Protective Association was taking action to control all rents. In December 1920, several hundred members filled city council chambers to submit 30 thousand petitions demanding passage of an ordinance to regulate rents. The account in the next day’s Los Angeles Herald described their demand for “stringent legislation to curb rent gouging in Los Angeles… [that would] fix the maximum legal returns to landlords at 11 per cent on their real estate investment and 16 percent on furniture.” [“Demand Law to Regulate Houserates: Petition Signed by 30,000 Demanding Ordinance Is Presented to L. A.” Los Angeles Herald, Number 34, 10 December 1920, A1.] (Due to high rates of tourism and migration to the city, many rental units were offered furnished). “the private ownership of real property constitutes a natural and legal monopoly of an absolute necessity of life that is subject to gross abuse, causing great hardships to the lessees by forcing them to contract under duress, by exacting extortionate rentals without statutory redress and jeopardizing the public peace, safety and welfare, through the increase of social unrest to the point of anarchy, thus coming well within the legal purview of the police powers of the municipality. The evils complained-about are not correctable by the operation of economic laws, but continually intensify under the concentration of population in centers of wealth and industry.” “Demand Law to Regulate Houserates, ibid. By March over 1000 renters were participating in the strike, [“Rent Strikers Gain Recruits.”Los Angeles Times, Mar 3, 1921, pg. II 8.] and tenants were heartened by an April decision by the U.S. Supreme Court upholding a rent control law in Washington D.C. that had been passed by Congress. [Block v. Hirsch, 256 U.S. 135 (1921).] Their optimism was short lived. On June 3, 1921, a judge ruled that the LA rent control ordinance was not a valid exercise of the police power, but instead a taking of property without due process. The decision drew a distinction between the Washington Dc regulations, which set rents based on the assessed value of properties, and the Los Angeles ordinance, which tied prices to how much money owners had invested to buy or build an apartment. [“City Rent Law Found Invalid.” Los Angeles Times. June 4, 1921. pg. A 9]. Though the judge pointed out a path for the city to amend its rent control to make it legally acceptable, Los Angeles didn’t pass another local rent control ordinance for 57 years. I haven’t done enough research to explore why tenants and their allies didn't organize another successful petition drive. Part of the reason may be that time went on the sense that the rental market was still part of the war emergency may have faded. Also, as I wrote about in my piece on LA’s ‘Forbidden City,’ the city’s combination of flexible zoning, high demand from new arrivals, and plenty of buildable land allowed homebuilding to recover and skyrocket throughout the 1920s. Permits for almost 20,000 homes were issued in 1921, and nearly 45,000 thousand homes were permitted in 1923. The housing shortage eased. Rents fell 28% between January 1923 and January 1929, and then, following the onset of the great depression, continued to fall until they reached a low in 1933 and rebounded. [Tom Austin. “Cupid Groans- As Rents go Higher.” The Apartment Journal. May 1935, p 13]. … if I have time, will follow up with accounts of federal rent control in place from 1941-1950 and 1971 to 1994 and LA’s rent stabilization in place since 1978. LA area residents fanned out last week to help complete the 2018 Greater Los Angeles Homelessness Count. It is worth celebrating efforts to make all Angelenos count- but it is also hard to feel optimistic that the number of people lacking homes will decline after steep rises in recent years. LA Times columnist Steve Lopez, who has written about the multi-faceted challenges of homelessness in Los Angeles, just published a hard-hitting round up of current public and private efforts to reduce homelessness. To create permanent supportive housing, the non profit agencies and developers who want to provide these homes need sites to construct new housing and/or adapt existing buildings to house residents and services. They can identify land already owned by service providers or public agencies or buy land on the market. The City of Los Angeles recently identified a number of publicly owned sites as “affordable housing opportunity sites” that could could include a mix of PSH, income restricted affordable housing, and market rate housing. This presents a good opportunity to allow more PSH units to be built because the cost of acquiring land is reduced. But unfortunately, some local residents have opposed use of sites near them for PSH or affordable housing. Council members from their districts have blocked or stalled approval of use of these public properties. Policy Fix: City Council should vote on a package of proposed affordable housing opportunity sites annually or semi-annually. This would help give council members plausible deniability that they cannot micro-manage what happens on sites in their district, and encourage them to vote based on the citywide need for more PSH. City departments and staff should also be more aggressive in identifying and releasing more opportunity sites. The passage of Measure HHH in the City of LA to fund permanent supportive housing, combined with LA County Measure H to fund services for the homeless, promised to increase development of PSH. There are however, political strings attached to the process. Proposals to receive HHH funding to buy and improve property must include a letter of support from the council office in which the project is located. This requirement was NOT included in the text of HHH (which was passed by 77.14% of those voting). It creates another political veto point that could slow PSH construction. Policy Fix: Remove the requirement for a letter of support from council offices. City Council appoints three of the seven members of the Citizen Oversight Committee that recommends annual spending plans for HHH funds and the City Council also gets to vote whether to approve the annual allocation plan. They do not need to individually ok or block individual sites in their districts. After a site and funding are obtained, a proposed permanent supportive housing facility still needs to obtain permits from the department of city planning (and other city departments). Focusing on planning approval, if a residential project includes fewer than 50 units AND does not need to seek variances for building height, setbacks, parking, allowed uses etc it can often proceed more quickly. This is because the project does not need to get political approval from the planning commission and City Council and cannot be sued under the state Environmental Quality Act. Delays to permanent supportive housing can arise if a project is adding more that 49 units of PSH or if it trying to transform a building where PSH units are not already allowed. Changing the rules to make it easier to build permanent supportive housing will not solve LA's homelessness crisis, but it will help. We also need to improve services; innovate in ways that we can temporarily house the homeless; allow more homes of all types and more housing subsidies to prevent people becoming homeless; and support proposed PSH when it does run up against opposition. still from LAFD's 1962 film "Design for Disaster"
With the LA region experiencing four large fires, I wanted to share hopes that damage to life and property can be limited. I also wanted to note how Los Angeles responded to past wildfires. The City of Los Angeles first generally applicable building code, like Ordinance 66, from 1883, were essentially expanded fire district codes: “An ordinance… for the protection of life and property from fire, and regulations concerning the erection of buildings.” Post WW2 residential development in the hillsides raised the specter of widespread risk from wildfires. As Stephen Pyne writes in Fire in America: A Cultural History of Wildland and Rural Fire. By the late 1950s, the Los Angeles Fire Department and national agonies and organizations had noted the high risk of building and living in Santa Monica mountains. The Bel Air fire of November 1961, which destroyed almost 500 homes, led to a number of reforms to building codes, new requirements for property owners and marketing by companies trying to sell security to worried homeowners. In 1962, the Los Angeles Fire Department released a 26 min film ”Designed for Disaster” that showed how roof shakes, inadequate water pressure and brush close to homes had raised the risk of fire and made it harder to fight. During debates over wood shake roofs, which had become popular “rustic” (and inexpensive) roof coverings for ranch style-homes, the wood shingle industry was on the defensive while cement roof tile companies worked with fire departments and fire insurance organizations to highlight the risks of flying shingles. The brief lesson is that major disasters like fires, landslides and earthquakes can become, in Thomas Birkland’s words, “focusing events” that grab the attention of decision-makers and the public, leading to policy responses. Robot Cars, Smart Streets & Tunnels: how should we prepare for autonomous vehicles? What happens when a new form of mobility is introduced? No one knows when, how or even whether autonomous vehicles will arrive as a significant real world transportation option. This lack of certainty creates space for technologies to be developed and tested, and time (at least a little) to think through what might be coming. Before summarizing a few visions of an autonomous car future, I’d like to jump back a century for a quick review of what happened when human-driven motor vehicles were first introduced in significant numbers. Los Angeles provides a useful case study. James Flink, in The Automobile Age, his cultural history of cars, stated that “A lifestyle based on mass personal automobility first developed in Southern California, and nowhere in the world has mass motorization been more pervasive in its impact." As early as 1910, the LA region had the most vehicles per capita in the United States. During the 1920s, the population of LA County doubled but the number of registered vehicles increased nearly sixfold, from 141,000 to 777,000. By 1950, the Los Angeles Planning Commission was bragging in its annual report that there were more motor vehicles in LA County than in any other region in the US or than in any other nation on earth. This rapid adoption of cars and trucks wasn’t without wrinkles and tension. Historian Ashleigh Brilliant discussed how popular and and legal attitudes on mass motorization in the LA region evolved. What began as a marvel at the new technology turned to shock as residents became exposed to levels of violence from vehicle crashes that few people had ever experienced outside of war zones. Society came to accept the new reality of speeding, death and traffic congestion, partly through black humor. Other policies, from road dedications to mandatory off-street parking requirements to street design guidelines and speed limits continued to shape a road network and set of rules that were highly favorable to passenger cars and commercial trucks. And while auto dealers and associations helped sponsor and promote pro-car traffic rules, it would be a mistake to think that the public was entirely 'duped’ by a vehicular conspiracy. People liked driving. Jeremiah Axelrod’s history Inventing Autopia recounts how Los Angeles residents protested a downtown on-street parking ban and voted down expansions of rapid transit in the key decades when car-use was exploding in LA. The take-aways from this capsule history are pretty obvious. 1. New technologies can rapidly reshape how we live and move. 2. Attitudes towards transportation are complex and can evolve to accept what may at first seem controversial. 3. And rules matter in determining what types of mobility predominate. Keep these in mind when you hear claims about autonomous vehicles. Because the challenges and opportunities are large, I’m happy to see that there are a diversity of visions for an autonomous vehicle future. To over-simplify these viewpoints, I’d classify them into three “schools.” We could call these the robot cars school, the smart streets school, and the tunnels school. These are each worth considering in their own right. I think that they also provide some useful overlapping projections and policy recommendations. The robot cars school posits that improvements to navigation systems (essentially, vehicle software), will allow ‘smart’ vehicles to drive on our existing ‘dumb’ road network. Because the intelligence in the system will be embedded in vehicle software and, presumably, in personal smartphones (or whatever the future version of connected devices are), autonomous vehicles will be able to transform how we get around without the need to reinvent streets or set up centralized systems to guide which cars go where. My summary of this approach to autonomous vehicles draws heavily upon a conversation I had with Brad Templeton, a long-time thinker on the topic. He recently spoke at an event hosted by the Berggruen Institute. Journalist John Markoff, the other speaker, provided a snapshot of how far self-driving car technology has come over the last decade. He has also written about some of the remaining technological and regulatory obstacles to autonomous vehicle development, testing and deployment. Templeton then cited the internet as an analogy of how he thinks autonomous vehicles might be deployed. Just as the diversity and innovation of the internet rests in individual websites and apps, connected through relatively simple infrastructure, Templeton stressed that a wide range of autonomous vehicle types could use existing street networks, from small shuttles he calls “the neighborhood elevator” that could take residents to their closest walkable commercial area, to single person robo taxis (half the width of our current cars), to shared autonomous taxis to smart vans. As a user, you wouldn’t really care what you were riding in because they would all be able to get you and drop you off and that waits for transfers between them would be very brief. While this vision of distributed, ubiquitous self-driving cars rests on a light regulatory touch and doesn’t require much coordination, Templeton does think that governments might have their own version of Waze in the future to address congestion, with capacity limits on certain streets. We also discussed the possibility for bikes to be a part of this ubiquitous network. He suggested that if you wanted to start or stop cycling, small robots could shift bikes around the city, hooking onto a bike and using its own wheels to move it, eliminating the need for a bike share station on every block. Templeton’s thoughts on autonomous vehicles are laid out in more detail on his website with updates and reactions to new developments at his blog. While I am mainly interested in how autonomous vehicles might impact mobility and urban form, it is also interesting to consider how self-driving vehicles would reshape the automobile industry and other aspects of car culture. Former General Motors exec Bob Lutz’s essay in Automobile News projects a sense of loss. His title “Kiss the good times goodbye” foreshadows his argument that “we are approaching the end of the automobile age.” Lutz believes that car as we know them will be replaced by “fully autonomous modules.” Sales to companies in the ride hail and freight businesses will shape the future of vehicles more than traditional marketing of cars to individual consumers. Driving by humans in most circumstances will be banned. It is interesting that the robot cars vision of interchangeable modules could presumably both retain small motorized vehicles as the core form of personal mobility and simultaneously undermine the powerful cultural role of car ownership and driving. 1. Safety is the Top Priority = set low (20 mph) speed limits on city streets as the norm and require autonomous vehicles to yield to people. 2. Provide Mobility for the Whole City. Assure flexible and affordable mobility options for every community, including walking, biking, fixed transit and ridesharing. 3. Rebalance the right of way = Since autonomous vehicles could move more people in fewer cars and less road space, reallocate street space to active and sustainable modes. 4. Manage streets in real time = use dynamic pricing and capture data (while protecting user privacy) to manage mobility. 5. Move more with fewer vehicles = encourage/ require shared vehicles and nudge public transit to adapt to be a part of the new mix of mobility options. 6. Public benefit guides private action = public policy goals should guide autonomous transportation and public/private partnerships. The report also includes policy goals aimed at implementing these principles. It then suggests (and shows examples of) how different types of streets and intersections could be designed to take advantage of autonomous vehicles and more mobility data. One of the most inspiring sections of the report is a sequence of text and graphics showing how a person in a wheelchair could cross a future street much more easily, because they could A. cross in the middle of block rather than needing to go to an intersection or crosswalk, B. the street wouldn’t have curbs between the sidewalk and roadway, and C. all vehicles would be autonomous and programmed to slow and stop for people walking or rolling in the road. In contrast to the more distributed, private-sector reliant robotcars model, the smart streets vision embodied in the autonomous urbanism report stresses the need for planning and policy to ensure positive outcomes. Transit should be improved and preserved as the backbone of mobility on high demand corridors. Pricing and regulation of routes, curbside management “or even a passenger trip assignment system” would help prevent competing companies from flooding streets with too many robo taxis. NACTO’s report can be accessed here. A network of tunnels in dense urban areas would be used to carry individual vehicles (presumably either human driven cars or autonomous cars) on what the boring company call ‘skates’ and considers to be autonomous vehicles in their own right. This would allow faster transportation by avoiding ground level congestion. Longer tunnels would carry intercity hyper loops. The ambition of this tunneling vision is evident in the combination of these two scales: recreating local roads and regional and interstate highways, but underground. These potential autonomous vehicle futures get more interesting when we consider how they might interact. Let’s assume that the key ‘driver’ of future mobility will be robot vehicles and that the intelligence in the system will be distributed in each vehicle rather than contained in a centrally controlled system. However, let’s also assume that we should require that robot cars be programmed to follow low speed limits and defer to people when driving on city streets. This combination of the robot car and smart/ complete/ pedestrian-prioritizing streets approach could yield safer local mobility in cities and reduce car ownership and the space needed for vehicle parking. But what about longer trips? As early as Los Angeles’ 1924 Major Traffic Street Plan, planners were pointing out conflicts between long-distance, high-speed trips across the region and local, stop-and-go trips. It was an early impetus for the construction of grade-separated roads (future freeways and highways) and for off-street parking requirements. Will current freeways remain the fast, long-distance transportation option in the future? Small local robot cars would maneuver safely and slowly among pedestrian, cyclists and other road users until they get to highways, then accelerate. This is where the tunnels concept seems like a useful alternative. If we want to have a safe, pedestrian-prioritizing city above-ground, maybe most fast travel should occur below. More tunnels could allow more subway transit and/or fast vehicle movement. Some highways could be removed and developed into housing, businesses and open space. Road fees as part of the mix would help fund conversion of streets to safer designs. (With bike infrastructure and vision zero safety improvements stalling, Los Angeles certainly needs all the help we can get in this regard). Fees could also help subsidize transit (including the ride share shuttle program Metro is exploring) and provide subsidies for lower-income residents to use autonomous vehicles of all types. I don't know for sure whether autonomous vehicles moving slowly in cities and quickly below is the future we need. But with California and the Federal Government providing a green light for companies to test autonomous vehicles, it is worth keeping one eye on the history of automobility and the other on options for a post-driving vehicle future. reforming property taxes in California! A while back I started a series of posts on how California could reform some of its key regulatory systems and institutions to become a more pro-housing state. Let’s continue this walk through significant institutions, looking today at California’s property tax rules. It is a little longer than the earlier set of posts- but hopefully worth it, because taxes have big impacts- hence the ! in the title. Taxes impact housing in a number of ways. Taxation influences decisions made by residents, property owners, investors, developers, and government decision makers. For example, tax codes can make it more or less advantageous to own and rent real estate. In the 1950s and 60s, moderately wealthy people like dentists and accountants built small apartments in large numbers in California, spurring the state’s ‘dingbat’ boom , partly for the income from rents, but partly to reduce their tax bills. Tax rules can also partly explain what types of homes get built where. This analysis from the Sightline institute suggests that tax laws are one of the main reasons why the vast majority of new multifamily homes in Seattle are apartments while developers overwhelmingly build condos in Vancouver. The federal and state mortgage interest deduction for income tax contributes to inequality because the majority of benefits go to wealthier (and white) taxpayers with more expensive homes. On the other hand, the largest source of funding for deed-restricted affordable housing in the United States is the Federal Low-Income Housing Tax Credits program. This post focuses on how the 1978 initiative Proposition 13 and its sequels have affected housing supply and affordability in California ans how we might reform these rules. The text of and arguments for and against Prop 13 are in this voters’ guide. It capped general property taxes at 1 percent of a property’s value. (Taxes associated with debt passed by voters, such as bonds to pay for schools or other purposes, could add to that so that rates could rise above 1 percent.) Prop 13 also set a property’s value for tax purposes at the 1975-76 assessed level, and limited increases in assessed value to 2 percent per year. It also raised the threshold to pass local special taxes to a 2/3rd vote. Prop 13 also tapped into conservative beliefs that much government spending was wasteful. So even though California cities, counties, and school districts received 27%, 40% and 47% of their funding respectively from property tax, voters were willing to take a gamble on the impact on services to reduce and partly cap their tax rates. After Prop 13 came into effect, its supporters pressed for a series of follow up ballot measures. . Props 218 and 62 broadened the requirement that local taxes need 2/3 voter approval. Props 58 and 193 allowed parents and grandparents to pass on the assessed value of their home to their heirs. 1. Primarily benefited wealthier homeowners and led to disparities between older and long time owners and newer home owners. The chart below from the LAO report shows the patchwork of valuation in part of Mid-City Los Angeles. Analysis by Trulia futher showed that homeowners in affluent cities often pay a lower property tax rate than residents in lower-income cities. 2. May not have significantly impacted approval of new homes by local governments. There is a widely held theory that Prop 13 contributed to the ‘fiscalization of land use’ because lower property taxes would cause local jurisdictions to favor commercial developments that brought new sales taxes or hotels (hotels can be taxed above and beyond their property value). The LAO analysis did not find that cities relying more heavily on sales tax revenue approved fewer new homes. However, there are clearly some cases in which the tax impacts of development do lead cities to favor non-residential projects. 3. Did contribute to residents selling homes less frequently and to lower-home ownership rates for younger California residents. 4. Did reduce new development because long-time property owners with lower assessments have less incentive to sell or build upon underused land. (See the chart below that shows a stark difference between adjacent properties based on length of ownership). 5. Did contribute to rising fees on new homes. Due to Props 13 and 218, raising local taxes requires a 2/3 vote by voters, while impact fees on development only need a nexus study and a majority vote by a city council or county supervisors. On this point, my Abundant Housing LA colleague Matt Dixon compared new home costs in the Inland Empire (San Bernardino and Riverside counties) with similar parts of the Phoenix metro area. Starter homes in the greater LA exurbs were $100,000 more than comparable homes in Arizona. While there are a range of factors contributing to the price difference, such as more expensive labor, Matt suggests that much higher development fees (up to $75,000 per home in the IE versus $20,000 or less in Maricopa County) was a major factor. A 2014 report on housing costs in San Diego County calculated that development fees averaging $54,000 per new home across 7 jurisdictions accounted for 11.75% of the average new home home. One factor that the LAO report didn’t try to measure was how Prop 13 impacted resident’s attitude towards new home construction. By allowing homeowners to reap the economic benefits of scarce supply and rising home values without having to pay more in taxes, Prop 13 arguably increased residents’ incentives to oppose residential development. This is related to William Fischel’s “home voter” hypothesis. As I suggested in the first post in this series, there was already slow-growth, anti-housing sentiment in many places before 1978 , but it may be that locking in lower property taxes for long-time property owners strengthened and sustained anti-development politics. What kinds of changes to taxes in California might help increase housing construction and tackle high costs? Prop 13 has long been considered a political ’third-rail.’ But its impacts on state revenues, especially education spending and other social services, as well as its differential treatment of owners based on date of purchase, have also made it a target for reform. 1. If we are concerned about fairness, then a basic reform would be to eliminate the inheritance exemption to the reassessment of properties upon transfer. This loophole, which applies to around ten percent of property transfers each year, means that primary residences inherited by children or grandchildren are exempt from being revalued to their current worth. The exemption also applies to an additional $1 million in second homes or business properties. These semi-feudal transfers of a lower tax valuation between generations results in lower revenues ($250 million per year in LA County alone) as well as increased inequities in the amount of property tax residents pay. Since children of homeowners tend to be more affluent than Californians whose parents do not own a home (average income of $70,000 vs. $50,000), the exemption also helps residents who would more likely be able to afford property tax on a reassessed home. This exemption should be eliminated. 2. Another loophole from reassessment upon transfer applies to corporate owned properties. Property may only be reassessed if a single person or entity acquires more than 50 percent of the voting stock of a corporation or a majority interest in a partnership or LLC changes hands. This allows owners to buy property using multiple companies without triggering reassessment. For example, in 2006 investors bought a hotel in Santa Monica with one family member purchasing 49 percent with a trust, another family member buying 42.5 percent with a company they fully controlled and the remaining 8.5 percent with a second company in which they were majority stockholder. The LA County Assessor tried to reassess the value of the hotel for tax purposes but courts blocked the reassessment because neither family member owned 50% of the property. Changing this loophole so that all sales result in reassessments would raise billions of dollars in revenue for the state. 3. The Make it Fair Campaign, which is currently the best-organized movement addressing Prop 13, would go one step further and require most commercial properties to be regularly reassessed. This approach is called a split-roll approach, because it would maintain Prop 13 for residential and agricultural properties. Half of increased revenues from updated assessment on larger commercial properties would be dedicated to schools and community colleges. The other half would go to ‘community services,’ and it is unclear if that would include affordable housing or housing-related services. 4. Going after commercial assessments is politically smart because it would not raise homeowners’ property taxes. Another potential Prop 13 (and sequels) reform that wouldn’t touch home tax assessments would be to eliminate the requirement for a 2/3 vote on local taxes, or lower the threshold for these votes. In 2000, the threshold for school bonds meeting certain requirements was lowered to 55%. Recent efforts to set the threshold at 55% for local transportation, affordable housing, water and parks taxes, however, have so far stalled. It is possible that a California Supreme Court decision earlier this year lowered the threshold for all general taxes by citizen-initiated ballot measures (as opposed to government initiated votes.) but there isn’t consensus yet on how the decision will be interpreted. 5. Political difficulty aside, it is probably worth pursuing tax reform for residential properties, because current rules do contribute to restraints on housing supply and mainly benefit wealthier residents. If Prop 13 was repealed or altered, it would still be possible to avoid sudden increases in property taxes by phasing in increased assessments; by having policy “circuit-breakers’ that limit the amount of increase in any year (which could be linked to residents’ income or wealth to avoid tax burdens to those who cannot afford to pay more) ; or by only collecting taxes on the higher valuation when a property is sold. (Although this last option might reduce home sales and increase prices). 7. California should also set upper limits on local development fees for new home construction. Development fees place the burden of needed public investments in affordable housing and infrastructure upgrades on just the small portion of pieces of land where homes are built (and the residents of these new units.) Property or parcel taxes spread the burden more broadly. While reforming prop 13 might tend to slow jurisdiction’s reliance on these fees by increasing revenue from property taxes, it may be worth also directly controlling fees by setting a maximum per home fee, possibly as a percent of local new home costs rather than a flat rate. 8. To spur construction of new homes, California could expand tax incentives for construction of multi-family housing. The state’s tax-increment financing for infrastructure districts (a partial replacement for redevelopment agencies) is too new to have been used widely yet, but recent changes may make it a more attractive option and could raise funds for affordable housing California could also provide a tax break to all types of multi-family home construction. This approach is widely used in New York and has also proved successful in Seattle. 9. The gold standard of pro-housing tax reform would be a full repeal of Prop 13 plus shifting of taxes from buildings to land. Prop 13 could be repealed but replaced with some type of income-linked circuit-breakers so that those who truly could not afford immediate increases in property tax would see a lower or phased-in raise. The repeal of Prop 13 would also open space for the state or local governments to implement a land value tax. LVTs are a potentially useful pro-housing policy because: “Conventional property tax pays people not to build things on their land, since doing so will mean having to pay more tax. But the Henry George Tax—which would replace conventional property taxes—makes buildings and other productive structures tax-free, thus encouraging landowners to build more of them.” Noah Smith calls a LVT a “Henry George Tax” in the linked piece after the idea's leading 19 century proponent. Henry George was a California resident for many years, so taxing land rather than housing would also honor one of our state’s most influential thinkers. Urbanize.LA published an article that LAplus' Mark Vallianatos wrote about the 'forbidden city' within Los Angeles. LA's forbidden city "consists of the many buildings that we inhabit, use and care about but that are illegal to build today. 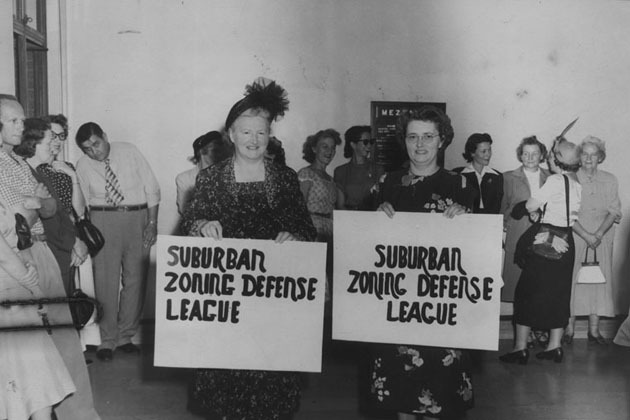 The article was based on a walk Mark led for Los Angeles Walks that explored how popular housing types like bungalow courts, courtyard apartments and dingbats were banned over time by changes to zoning rules (especially parking and yard requirements and density limits. The article concludes that we can learn from this history and make it easier to build diverse, low rise housing in LA. Check it out for details on how the city forbid some of its most essential characteristics and how we can get them back. For day two of state housing week, we examine a pair of landmark environmental laws: CEQA and the Coastal Act. For good reasons, the assumptions behind much of the important environmental legislation passed in the late 1960s and early 1970s was that human activity was destroying the planet and that ordinary residents didn’t have a voice in large scale projects and decisions that impacted their lives and surroundings. As a result, many of the new rules motivated by the ecology movement created processes to scrutinize, study and sometimes limit or stop activities that were considered to be problematic. Land development and residential construction played a major role in sparking environmental awareness. Homebuilding was impacted by the new environmental framework. I worked for environmental groups for twenty years. In examining these measures I am trying to respect their spirit by suggesting changes that will lead to better environment outcomes. Whereas CEQA was motivated skepticism towards change, the Coastal Act also included proactive, positive goals like enhancing access. How can we balance caution and hope? Newer environmental challenges like climate change and environmental injustice may require rapid shifts in existing patterns of habitation, transportation and industry, not just scrutiny of harmful proposals. It will take different tools to unpave paradise than it took to prevent it from being paved. 2. “Restrict judicial invalidation of project approvals to those projects that would harm public health, destroy irreplaceable tribal resources or threaten the ecology.” (This is a direct quote from Holland & Knight’s report on CEQA abuses.) In an example close to where I live, a judge found that the climate change impact analysis for a mixed income housing development on the parking lot of a light rail station was insufficient. Rather than requiring this part of the EIR to be updated, the city’s approval of the entire project was revoked. 4. “Flip” the assumptions of CEQA impact and mitigation analysis for housing and planning in urban areas. The way CEQA has been written and interpreted, the more new homes that are proposedto be built in a specific development, or the more zoned capacity for future housing that is proposed for a land use plan, the more impacts there are considered to be and the more mitigation measures have to be adopted. Alternatives analysis for both housing developments and plans also assume that ‘less is better.’ The statue should be amended to acknowledge the environmental benefits of adding housing in areas where per capita driving and energy and water use are low. In these urban settings, failing to approve or zone for new homes should be the negative environmental impact that needs to be justified and mitigated. 1. Limit the Commission’s power over development in already urbanized areas to ensuring physical access to the coast, requiring replacement of demolished affordable homes and accommodations, and limiting destruction of natural resources. The commission should not have authority over building height or aesthetics in already developed urban areas. 2. Add a new article to the Coastal Act’s policy chapter focusing on climate change. Recent interpretation of CEQA have made it harder for cities to use EIRs to require new buildings to be designed so that habitable floors of homes are above anticipated sea rise and flood levels. The coastal act could take up some of the slack by addressing siting and construction of new housing. 3. Strengthen goals of encouraging coastal access by encouraging more homes of all types near the coast (to complement strategies to encourage people from all over to visit coastal areas). The Coastal act includes language on the positive interaction of denser development and mass transit in coastal urban areas. But as with CEQA, it is easy to use the Coastal Commission to block a three story building but hard to require cities to adequately upzone. Letting more people live near the coast will allow more people to enjoy it. Building more homes of all types closer to the coast will also help address the climate change challenge of rising heat impacting the many Californians forced to lived in hot areas inland due to high costs closer to the Ocean. I'm not sure how best to accomplish this goal without contradicting point 1 above. Maybe coastal plans could remove local limits on density near transit? Last week Abundant Housing LA and the USC Price School’s Urban Growth Seminar hosted Senator Scott Wiener and Assemblyman Richard Bloom, who discussed their interests in housing and some of the bills that they had sponsored this year. Both stressed that this session’s housing legislation is just a start and that residents need to keep the pressure on to make it easier to build homes and to fund affordable housing. Even if the key 2017 bills pass, they are expected to be just a ‘downpayment’ on California’s housing crisis: decades of underproduction of new housing and the 1.7 million low income residents who spend more than half their income on rent. Senator Weiner also referenced the emergence a pro-housing movement in the state. Earlier this summer I attended YIMBYtown 2017 in Oakland, the second annual conference of groups that identify as YIMBY (yes in my back yard) advocates for more homes of all types. It was informative and inspiring to learn about housing situations and strategies in other places. I participated in a session organized by Abundant Housing LAon the defeat of Measure S.
I also presented on the roots of and potential solutions to California’s housing crisis. I called the session “Unhousing the Golden State: who did it and how to fix it?” In retrospect, this title claims too much certainty for such a complicated topic. But I think that there are some useful ideas from the talk worth sharing as state leaders look to address housing policy this legislative session and in future sessions. Before sharing reform ideas, let me provide a brief summary of the first half of the presentation, which explored the roots of the state’s housing crisis. For much of the 19th and 20th centuries, California had a boom mentality. Home building was accepted, celebrated and incorporated into the mythology and publicity of local and regional boosterism. Racist restrictions on non-whites residency and property ownership was an exception to (or core component of) this pro-housing consensus. • Exclusionary suburbanism sought private and public restrictions on who could live where and what type of housing was allowed in certain neighborhoods. • Good planning reacted to and attempted to constrain the exuberance of speculative housing production. • Counter-culture romanticism challenged assumptions at the heart of housing booms: that more was better and that homes should be built and sold through mass production. • The ecology movement quantified problems with rapid growth and gave nascent anti-development homeowner activists a kind of urgent and neutral/scientific cover. • Historic preservation questioned the cycle of building, demolition and re-building that characterized both private construction and pubic redevelopment. • The new right fought against public housing and fair housing laws and for lower property taxes. • The new left sought to de-commodify housing and democratize land use decisions through regulations to make market housing construction less profitable. • ‘Quality of life’ nimbyism mastered procedural and legal tools to slow and stop developments that might impact traffic or other local concerns. • Community control / anti-displacement advocates raised concerns over development in lower income areas. These overlapping currents led residents to question both fast-moving land development and a generous, well-resourced state. They helped forge political coalitions skeptical of development. They also contributed to local and state planning and policy regimes that empowered locals to scrutinize and slow housing construction. An important take away from this capsule history ofhousing skepticism is that we are all ‘guilty’, or at least all suspects, in laying the groundwork for the state’s housing crisis. By this I mean that most Californians share at least some values and goals with some of the trends that contributed to the state’s housing shortage. Shifting California back to become a more pro-housing state will require reforging a pro-housing majority. Advocates and decision makers therefore need to consider the concerns listed above in order to synthesize a new pro-housing consensus. It will probably take both a broad cultural shift on housing and a specific reform agenda to address the obstacles to more and better homes in California. It also should be said that some policy obstacles are federal, beyond the scope of this post; and that policy is only a piece of the puzzle. Trends in the finance, construction and sale of homes; the availability and cost of of land, labor and materials; and changing demographic and lives styles have all contributed to our current housing challenges. The mix of anti-housing attitudes described above became embedded in important state and local policy frameworks. To improve California’s housing situation, we need to consider how to reformthese rules. Changing them can help reduce obstacles to enough homes for all. But that’s not all. Addressing these systems is also an opportunity to reexamine and update old systems to reflect modern priorities. Some of our current rule structures, like zoning, began to take shape in the 1920s. Another wave of institutions, such as CEQA and prop 13, are legacies of the 1970s. What would a 2020 approach to California governance and planning look like to address today’s challenges and opportunities? The following list of state policy ideas is drawn from my YIMBYtown presentation. It also includes suggestions from conversations with housing advocates and experts, including Greg Morrow from Pepperdine, Brian Hanlon from California Yimby, Sonja Trauss from BARF, Mike Manville, Michael Lens and Paavo Monkkonen from ULCA, Mott Smith and Ava Bromberg from LAplus and steering committee members from Abundant Housing LA. But I am responsible/ to blame for the list in full and for how I present the ideas. Strong local zoning lies at the heart of many of our housing woes. Local substantive standards and procedural delays limit the number of homes that get built in California, add to the cost of housing, and increase social segregation. - reduce limits on where mobile home parks or other more naturally affordable homes are allowed. - make all permanent supportive housing for the homeless by right. - set jurisdictions’ RHNA targets based on past deficits and current overcrowding and vacancy rates, not just anticipated population growth. - require some percent of the target to be actually built. (Senator Wiener’s SB 35 is a move in this direction by allowing more by right when cities do not meet their RHNA targets). - Require jurisdictions that plan land use at the sub-municipal level (like LA city with its 35 community plans) to allocate their RHNA at the local plan level so that wealthier, more politically connected areas don't avoid adding new homes. - reward cities that meet their targets with more state funds to help overcome both local opposition to new homes. - As an alternative, downplay the RHNA as over-planning (trying to determine what types of homes and people should be in what areas is inherently complex) and instead A. require general adequateand flexible zoning that can accommodate a range of housing types (see below) and B. better enforce fair housing rules to break down exclusionary zoning. - adopt a statewide zoning code modeled loosely after federal zoning systems in Japan and Germany. - grant California’s 18 metropolitan planning organizations some of the zoning authority currently held by cities and counties. (I ran a twitter poll on this idea and while 60% of respondents thought it would be an improvement, some commenters noted that one would want to reform MPOs themselves to ensure that they better represent populations rather than just individual cities). - create state or regional zoning appellate bodies with authority to override local decisions that block and delay homes that meet regional plans, like the (recently weakened/transformed) Ontario Municipal Board that had this power in the Toronto region. Next installment- CEQA & the Coastal Commission..
City of Angels or City of Lights? We may will find out very soon whether Los Angeles or Paris will be awarded the 2024 Summer Olympics and Paralympics. If Los Angeles gets the nod, LA2024 will mark the 40th anniversary of the region’s 1984 Olympics. Reports, however, suggest that the International Olympic Committee is likely to award the 2024 games to Paris and simultaneously offer the 2028 Olympics to Los Angeles. Whether LA2024 or LA2028, I’m excited that the Olympics may return to Los Angeles. I’’m happy that LA residents are not afraid to host the games. I also want to counter some recent claims that the Olympics would be a terrible and destructive “invasion.” I think that these arguments are largely unfounded. Emerging as they are from the left, I also think that they can be self-defeating. In my opinion, tarring the Olympics as catastrophe in the making doesn’t advance a progressive agenda. This kind of thinking can undercut our ability to collectively imagine and achieve a better Los Angeles. During the run-up to the 2024 selection, an unusual number of potential host cities withdrew their bids. Boston, which had been selected as the US nominee, backed out when city leaders couldn’t convince a majority of residents to support hosting the games. Hamburg, Rome and Budapest also withdrew due to public opposition and/or change in municipal leadership. Polls in Paris have found that upwards of 70 percent of residents support hosting the games. A 2016 poll in Los Angeles showed even more enthusiasm, with nearly 90 percent of respondents in favor. While all demographics support LA hosting the Olympics, the most enthusiastic support comes from lower-income people of color. The Olympics polled at close to 95 percent support, for example, with poorer, Spanish-speaking Latina mothers. Those most likely to strongly oppose the Olympics are conservative, white, male, English-speaking, baby-boomer, highly-educated, homeowners who have lived in LA 6-15 years, and earn more than $150,000/ year. What explains this openness among Parisians and Angelenos? Part of the reason may be that bids by the two finalists rely heavily on already existing facilities, and both cities have experience hosting large events and accommodating visitors. Locals may assume that their region can host the Olympics in a way that brings excitement and an economic boost while minimizing disruption. I wonder if the differences between attitudes in LA and Boston, or Paris and Rome, runs deeper than logistics. Parisians may be signaling a desire to come together and maintain an openness to the world following terrorist attacks. Los Angeles residents could have a more informal and optimistic attitude than Bostonians. So why do socialists hate it? The Los Angeles chapter of the Democratic Socialists of America recently launched a NOlympics LA group. Their campaign to stop LA from hosting the Olympics has been endorsed by several other organizations that work on issues imputing low-income residents. When I first read the NOlympics site, I was confused. Why was the DSA targeting an event that has wildly high levels of support from working class Angelenos? Are the people deluded? Many critiques of the Olympics focus on cost overruns and the disuse of facilities after the end of the games. NoOlympics LA argues that even a financially and logistically successful Olympics would devastate Los Angeles. Their site gives five reasons to oppose hosting the Olympics. First, they argue that the IOC is a corrupt organization that does not “care about the cities they invade. If LA hosts the Olympics, it will be nothing short of a wide-reaching, incalculably destructive media party for millionaires and billionaires.” Even if we assume that corrupt officials, wealthy tourists and corporate sponsors will descend upon Los Angeles, shouldn’t we also consider others who will participate in and attend the event? I get the appeal of ‘the people versus the powerful’ but it seems like the NOlympics effort is more interested in spiting elites than fulfilling the desires of millions of residents. Hearts starve as well as bodies; bread and roses, bread and roses." Opponents might, however, argue that ‘bread and circuses’ is the better metaphor for the Olympics, that it will be a cause of and cover for all kinds of oppression. Nolypmics LA’ second reason to oppose the Olympics is that it “will most likely be used as a pretext for developers and politicians to advance projects that will increase real estate values and commerce in certain areas, not benefit the current residents.” The LA Olympics plan is light on new construction, so it will not be directly displacing residents. It’s unclear whether the Olympics could accelerate commerce and development beyond current trends. But since Los Angeles is marked by persistent segregation, poverty and housing shortages, more commerce, especially in lower income areas, wouldn’t be a bad thing. Some critics believe that the 1984 Olympics was a significant breaking point in police-community relations, and that tactics pioneered during the games helped cause LA’s 1992 civil unrest. This theory doesn’t seem to be born out by the history. There was a heavier than usual police presence in south Los Angeles during the Olympics. In his autobiography Chief: My Life in the LAPD, Daryl Gates devotes a chapter to the Olympics, filled mainly with worries about terrorism and squabbles with LAOOC organizer Peter Ueberroth. He brings up gangs in the context of his concern that they might get hired by terrorists, and writes: “we would send our gang details our to clean up the streets around the Coliseum.. run the gangs right out of the area with a few well-chosen words, and post enough police to discourage them from returning too soon.” As far as I can tell, however, there weren’t mass raids or arrests. Some South LA residents did complain when police levels were drawn down after the games. Gates covers Operation Hammer (an aggressive LAPD anti-gang campaign that started in 1987-1988) in another chapter, but doesn’t link it to Olympic innovations. In case Gates had forgotten (or didn’t want) to connect these dots, we can turn to Mike Davis’ lengthy discussion of Operation Hammer in City of Quartz. Davis doesn’t discuss the Olympics either, but engages with LA’s long history of segregation, repressive police tactics, lack of jobs for African Americans, the crack epidemic, and the history of black and Latino gangs. The Olympics seems to have been a blip in a long history of problems with policing in Los Angeles rather than a key training grounds for repression. Law enforcement, public safety and civil rights and liberties are vital issues. We have made some progress on them, but there is still a need for more reform. I think that it diminishes them to cry wolf on the Olympics. The fourth reason given to oppose LA2024 is that Olympic jobs “will lead to massive influx of out-of-town temporary workers, which puts local workers in a difficult negotiating position and by creating an additional category of workers, ultimately weakens protections for and increases the likelihood of exploitation for all workers.” An economic impact study commissioned by the LA2024 Olymoic committee found a “low estimate of $4.38 billion in worker earnings and 62,456 full time (temporary) jobs.” While these jobs will not solve unemployment and underemployment in Los Angeles, they will be a good thing. LA2024 will need to sign labor agreements with local unions, and they will be representing the interests of their members and other workers. Plus labor and immigrant rights leader Maria Elena Durazo is one of the vice-chairs of LA2024. I don’t see any evidence for the xenophobic claim that out of town workers will hurt the interests of local labor. In fact, if we look at the 1984 Olympics, it is safer to assume that local young people will be trained to fill some of these positions. The final reason that the No campaign gives to oppose the Olympics is that it will divert resources from addressing homelessness, poverty, our affordable housing crisis, and police and prison abuses. “We believe that resolving these crises as quickly and humanely as possible should be our city’s priority, and that for our city’s leaders and elected officials to waste this much money and energy on any other goal is unconscionable.” I agree that these challenges should be priorities. But the idea that we can only tackle one set of issues by ignoring everything else is naive because of how issues are interwoven; misleading because LA voters just voted to tax themselves to fund housing and services for the homeless- while also overwhelmingly support hosting the Olympics; and self-defeating. Why should we believe that a city plotting a destructive and oppressive Olympic invasion can effectively address the public interest in any other field? In the wake of the 1984 Olympics, the South-Central Organizing Committee, a civil rights and anti-poverty coalition, pushed for a ‘permanent Olympics’ to continue the good planning, coordination and investments seen before and during the event. Their lead organizer argued that “The Olympics, and also the Metro Rail (subway) project has shown things can happen if enough people want them to. It eliminates all the excuses.” They sought “long term support not only for jobs, but also for better health care, education and recreation in the city’s poor areas.” This level of investment in the region’s low-income residents and neighborhoods didn’t materialize. The relative failure of the Rebuild LA initiative launched after the 1992 civil unrest (and partly inspired by the success of the 84 games) shows the limits of private sector-led promises to tackle complex urban challenges. Even if LA gets the 2028 Olympics, I doubt that it would be possible to return to the original Olympic village/ housing plan. There are barriers to acquire the land from its railroad owner and to develop the site, and it runs counter to the LA2024 plan of minimizing new facilities. But to buy (or eminent domain) land on which to construct badly-needed homes, that would be a worthy socialist campaign. It would be an example of society doing something positive on a scale commensurate with the challenges we face. I support Los Angeles’ bid for the 2024 or 2028 Olympics partly because it shows that the region has the spirit and capacity to accomplish something that is both logistically complex and small-d democratic, in that it celebrates sports and allows millions of people to participate as fans. I also hope that the Olympics will help reinforce that LA is a region rather than just a parochial collection of cities and neighborhoods. Writing just after the 1984 Olympics, Peter King and Robert Jones noted that residents had discovered that “the walls that they built both literally and figuratively, and the walls that their own cities have built politically, are not as real as they imagined.” Given the authoritarian nationalism rising at the federal level in the United States, which is already reducing the number of international visitors to Los Angeles, holding the Olympics in LA would also be a chance to welcome the world. 1. Price ticket so that lower income residents (who are biggest supporters of hosting the Olympics) can afford to attend. LA officials have said that they are basing their ticket pricing on the 2012 London Olympics. The London Olympics had some programs to encourage attendance by ordinary people, include a ‘pay your age’ program for younger fans and discounts for seniors. We should extend this type of plan for all lower-income fans. Maybe a ‘pay your wage’ plan so someone making $12 an hour could get a ticket to some events for 12 bucks. 2. Plan for an Olympic legacy by considering how to spend any surplus and how to use updated facilities. The LA84 Foundation has donated millions of dollars taken from the surplus revenues from the 1984 Olympics to support youth sports. Park facilities and athletic opportunities are not equitably distributed in the region, so funds from a future Oylmpics could help bridge these gaps. 3. Learn from the Paralympics in order to advance universal design and accessibility in the LA region. While the city of Los Angeles was forced by a lawsuit to invest over a billion dollars to make sidewalks more accessible to residents using wheelchairs, there are still major barriers in public places and in many private buildings. 4. Support female athletes fighting for equal pay. 5. Ensure that rights of assembly and free speech are not suppressed. Los Angeles police have a history of mismanaging protests such as at the 2000 Democratic national convention, although the lack of problems at the recent large Women’s March suggests that the city should be able to handle demonstrations in a more respectful and effective manner. 6. Connect with visitors. In a world of resurgent nationalism, some have argued that cities can help uphold cosmopolitan and progressive values. Advocates and residents should take advantage of the Olympics- in between having fun- to share ideas with international guests. 7. Think regionally. Los Angeles faces many challenges that will not be worsened by - or solved by- the Olympics. We can be inspired by its cross-jurisdictional ambitions, and learn from its limitations. How can the LA region do more to expand our housing supply, transition to clean energy and transportation, and share resources so that greater LA is more prosperous, inclusive and sustainable? I'm sure there are more areas for improvement and accountability. Critics and watchdogs are also useful; they raise questions and provide debate and oversight. So it’s not terrible that the DSA and others are opposing the Olympics in Los Angeles. I wanted to provide a counterpoint because I believe that we need to expand our capacity to implement ambitious change in the Los Angeles region. The Olympics are just sports, but they are also a test case for coordination and planning and for shaping an event that can advance a cosmopolitan openness and allow people to have fun. In the lead up to and beyond the Olympics, I hope that many residents and organizations that consider themselves to be progressive in their perspectives will embrace an imaginative and critical optimism with regards to the infrastructural, political, social and environmental opportunities for a better LA. Los Angeles Sentinel. “The Olympic Torch.” July 19, 1984, A6. William Overend. “Judge Scolds Investigators for Treatment of Souvenir Peddlers.” Los Angeles Times, July 31, 1984, A3. Jill Stewart and Laura Becklund. “Tongans Angered at INS Arrest of 79 Olympics Tourists.” Los Angeles Times, August 13, 1984, OC A5. Kenneth Reich. “Coalition Revises Protest Plans: Seeks Police OK for Anti-Reagan Demonstration. Evan Maxwell, “22 Arrested in Melees During Youth Protest.” Los Angeles Times, August 7, 1984, A14. Last month I participated in a panel on Development without Displacement at ULI Los Angeles’ annual Urban Marketplace event. I think the topic was important and enjoyed the discussion with fellow panelists Alex Guererro, Hassan Ihkrata, and Ken Lombard, moderator Raphael Bostic and audience members. Thanks to ULI for the opportunity to participate. I also co-facilitated a roundtable on Residents as City Builders with Ilaria Mazzoleni of cohousing group InHabitLA. I think building groups, co-housing and co-ops are great ways to diversity housing and let more residents actively shape their homes and the city. We will post more about this topic as we explore housing innovation and urban change. 1. LA’s most significant spatial and demographic trend is persistent segregation. 2. most evictions and displacement are caused by poverty and accompanying precarity. A. New development is out-of-scale and destroying neighborhood character. B. Gentrification is rapidly displacing poor people from LA. All of these trends intersect and all of them impact people’s lives in different places, at different scales. But I worry that our plans and policies are doing too little to address segregation and poverty. This is partly because they are difficult challenges, and no strategy for economic and community development has succeeded in solving them. Some of our inattention may also be because our fears of change can warp our priorities, leading us to try to address what I would consider to be second level challenges while our top problems continue to fester. I used to assign Robert Sampson’s book Great American City to students in urban policy classes I taught. It provides a detailed look at how “concentrated disadvantage” in Chicago- that is, being poor in a neighborhood with high poverty rates- impacts residents’ life trajectories. The book is a good introduction to how place impacts peoples’ lives: racism, segregation, poverty, ‘blight,’ crime, unemployment, incarceration, and residents ability to improve neighborhoods. Sampson and colleagues have more recently used a dataset following families in the Los Angeles area to assess segregation by income in Los Angeles over time. While they entered the study wondering if LA’s characteristics as a newer, sunbelt city with more dispersed development patterns might make it less vulnerable to persistent segregation than Chicago, the results show severe neighborhood and individual segregation are a huge problem in LA. The research also investigated individuals to see if residents remained in the same type of neighborhood, or if they ended up in wealthier or poorer places (due to moving or a neighborhood changing around them.) Between 2000 to 2013, “75 percent of individuals who resided in the most affluent neighborhoods at baseline preserve their neighborhood position thirteen years later, versus an average of about 40 percent among respondents who resided within the least affluent neighborhood stratum at wave 1. If we consider the bottom two-fifths as lower-income brackets, nearly 80 percent of adults who started in these lower two groups remain there over the course of the study.” Residents who moved during this period achieved slightly better outcomes in terms of ending up in wealthier neighborhoods, but nor by much, showing barriers to upward mobility. Sampson et al. "Urban Income Inequality and the Great Recession in Sunbelt Form: Disentangling Individual and Neighborhood-Level Change in Los Angeles." RSF: The Russell Sage Foundation Journal of the Social Sciences, 3(2), 102–128 (2017). Much of our economic segregation is a result of racial discrimination. Los Angeles is an ethnically diverse place, and the combination of this diversity, the removal of explicitly racist barriers to where people can live, and past white flight has led to the reduction of completely racially segregated neighborhoods. A study by the London School of Economics and Political Science shows that the percentage of Angelenos who live in neighborhoods ‘strongly segregated’ by race declined from 40% in 2000 to 33% in 2010. Another study of demographic patterns in LA since the civil rights movements, however, shows that most of the ‘pathways’ by which neighborhoods change lead to increased racial segregation rather than to integration. The three pathways to integration are desegregation of mainly white neighborhoods, gentrification of mainly non-white areas, and maintenance of diversity in places where no group has a majority share (most of which are in suburban areas). Bader, Michael D. M.,and Siri Warkentien. 2016. “The Fragmented Evolution of Racial Integration since the Civil Rights Movement.” Sociological Science 3: 135-166. Sociologist Matthew Desmond recently won the 2017 Pulitzer Prize for nonfiction for his book Evicted: Poverty and Profit in the American City Evicted is rightly celebrated for putting human faces (both tenants and landlords) to the crisis of urban poverty and evictions. His 2016 paper “Who gets evicted?” provides data from Milwaukee to help understand “individual, neighborhood, and social network characteristics” that influence why some low income renters get evicted while others don’t. Eviction isn’t exactly the same thing as displacement because there are additional reasons why people might involuntarily leave their homes. Still, most quantitative research on gentrification suggests that it does not lead to large increases in displacement. At the ULI forum, I said that in LA “we have displacement without development.” We continue to build housing in the LA region and in California at a rate that is significantly lower than in past decades. As a result, between 2005 and 2015, the state experienced a new loss of 800,000 people living near the poverty line. This isn’t to say that there aren’t people being evicted or otherwise displaced because their homes are being demolished or remodeled to make room for newer, more expensive building- just that this is dwarfed by loss of homes due to poverty and housing shortages. Gentrification is increasing in large American cities. Gentrifiers are mainly younger, educated, childless whites and middle class people of color. Gentrification can cause direct displacement and a small increase in overall displacement. Gentrification does not cause vulnerable populations to leave gentrifying neighborhoods at greater rates than non-gentrifying areas. Rents rise in gentrifying neighborhoods. Incomes and credit scores of existing residents rise in gentrifying areas. Diverse housing (public, affordable, rent control and market rate construction) all help residents stay in gentrifying neighborhoods. Existing renters who stay in gentrifying neighborhoods show an increase in satisfaction with their neighborhoods. Gentrification happens more in areas that are already racially diverse. The third point I made at the ULI forum was that we need a pro-change coalition to address continued segregation + poverty-driven displacement. To integrate LA and to reduce poverty (not to mentioning achieving environmental goals), I think we need to accelerate rather than slow change, and to reduce rather than erect internal walls between neighborhoods and cities. How can we make it easier to “affirmatively further fair housing” with more subsidized and middle income homes in wealthy areas and more market rate homes in low income communities? How do we increase assistance to low income households and increase investments in poor neighborhoods? What would this agenda look like in plans and policies? These are big questions. I’ll come back to them in future posts. This week marks the 25th Anniversary of the LA’s 1992 Civil Unrest and very little has changed for people of color in LA. While people will examine the violence, damage, chaos, and the aftermath from the unrest, as an urban planner of color I see and have lived the systematic inequities that caused these civic tensions. Some Anglenos are born with a swimming pool in their backyards. I on the other hand was born into a landscape of insurrection giving me different perspective of the city. Most planners see their role as keeping the city organized and tidy. I on the other hand, based on my early experiences see the city as imperfect, imaginative, changing, and full of energy. At age 5, I vividly remember the landscapes created by the Watts Riots. During that time my parents drove to their friend’s home near Budlong Street by USC to check up on them. Like plastic green toy soldiers, there were real-life soldiers stationed along the streets at random corners. I was expecting to see a tank but no luck! Arriving on their street I found an ire silence. The front yards where a few weeks earlier we played with African Americans children became a demilitarized zone. A lady came out of their home nervously to say they were not home and to warn us of snipers. I imagined that behind the venetian blinds covering the large arched windows of the small Spanish bungalows were men with long barrel rifles ready to shot us, like in the movies. This was my last trip to their neighborhood because shortly after they moved to a mid-century house on a cul-de-sac in Norwalk. Like tourists a few days after the Watts riots, my uncle instead of driving us to the park, on our Sunday trips drove us to 103rd Street to see all the burned out buildings against the wishes of my aunt. I saw lots the charred wood beams between the brick walks of what were once businesses. At age 11, I remember the warm day of the Chicano Moratorium because we lived down the street from Whittier Boulevard where it took place. That day my mother was drinking wine in the backyard with a friend who had just came back from the Laguna Park and gave us a first hand account of what went on with the police sirens and smoke in the background. The next day I rode my bike to Whittier Boulevard to check out the damaged buildings. My mother had worked as a beautician at Johnsons Market for many years so I was very familiar with the drug stores, clothing stores, record shops, and movie theaters that lined the street. When I was growing up. Whittier Boulevard was the epicenter for Chicano life in Los Angeles. On the weekends shoppers and cruisers share the streets and sidewalks creating a pulse and energy of people looking for a parking space, getting their hair done, or buying records or clothes for a night out on the town. Seeing all the damaged buildings and broken pieces on Whittier that day made me realize how fragile, venerable places are. And wondering- will that pulse return? In 1992 I started my first urban planning job out of MIT, working for the city of Santa Monica. When the civil unrest started I was on the other side of town and could view it on TV. When they released us early from work, I chose to drive down Sunset because the 10 Freeway would have led right into the epicenter of fires. Like a sci-fi movie, it took me 3 hours to drive from Santa Monica to Fairfax on Sunset because everyone was in their cars trying to get over the hill for safety! For the next few days most of the LA basin was in chaos not just the African-American or Latino neighborhoods. Looting and burning were wide spread. People didn’t know how to make sense of the chaos. Was it race, income, lack of police protection, or was it stoked by media coverage? I guess we will never know. This time, however, I understood the systematic inequities that created the unrest. These life situations have given me a deeper understanding of LA as an urban planner -both the tangibles and intangibles. When I started working as a professional planner I was so surprised to learn that most LA planners were not from LA, or from places like East Los Angeles. They were from Orange County and places beyond. They are less likely to see LA’s history of civil unrest as a wake up call to create a better world. History is not embedded in civic DNA or built environment of LA. Rather everyone carries his or her personal history. Angelenos wander LA in silos looking for the next thrill to feed our personal history and create a temporary sense of belonging at the expense of intimacy with place and each other. LA’s lack of civic history and intimacy with each other and with place, maintains the structural inequities in LA’s urban planning. Today urban planners believe that social media or apps are best way to engage under represented communities. They believe TOD’s, parklets, Ciclavia, food trucks, bike lanes, public art, and other physical interventions are going to make LA a better city like San Francisco or Portland. What the planners don’t realize is that planning with communities of color is about relationship building because due to lack of infrastructure, this is how these communities survive. Relationship building through storytelling, objects, art making and play-based planning has driven my work for the past 25 years. I have used my research on Latino urbanism to build planning capacity for Latinas and others not usually represented at public meetings. My Place IT! process uses story telling, objects, art-making and play as a way to explore people’s attachment to each other and to place. What the civil unrest didn’t destroy in 1992, inequality and poverty continue to erode today. Yet too often planning in LA is too busy thinking and and talking about the next best thing to be concerned with addressing inequities in the rest of city. Most conversations about planning and zoning in Los Angeles understandably look forward and look up. Where should LA grow? How can we remain a diverse city in the face of high housing costs? But one of our greatest land use challenges lies below, in the active oil wells that pepper LA’s residential neighborhoods, causing concerns about toxic emissions and residents’ health. This motion raises questions on the best ways to protect health and to regulate clashing land uses. Is zoning the right tool, regulations targeted to the risk, or both? How can we assess the environmental impacts of proposed (future) activities and structures AND already existing uses and systems? There are over 1000 active oil wells in the City of Los Angeles, and 3000 in LA County. The potential health threats are especially worrisome in low-income communities already burdened by pollution from freeways, freight facilities, oil refineries and other small and large industrial sites. This map from a report by my former Occidental College colleagues Bhavna Shamasundra and Jim Sadd shows that while active oil fields extend across swathes of the LA region, some concentrations of active wells overlap with neighborhoods that are among the most disadvantaged and most heavily polluted in the state. Oil production was one of the LA region’s earliest and therefore formative industries. Historian Fred Viehe has argued that oil industry was as or more influential than transportation patterns in shaping the geography of Southern California. He writes that “the extractive industry was responsible for both suburban dispersal and metropolitan fragmentation in southern Los Angeles County and northern Orange County.. More specifically, the industrial suburbs around Los Angeles contained derricks, refineries, and tank farms, while residential suburbs incorporated..” near each of these oil drilling clusters to provide dwellings for workers and their families. The City of Los Angeles never adequately controlled where and how drilling could take place. For a short period in the late 1890s and early 1900s, drilling was banned within 1,600 feet of city parks. Yet, LA also allowed oil drilling districts to be established in already-populated residential areas. In 1946, the last time LA comprehensively updated its zoning, there were already 29 oil drilling districts. We are still living with this patchwork approach to oil and gas production. As a result, residents living near wells complain of headaches, nausea, bloody noses, asthma attacks, and frequent visits to the emergency room. Residents may not receive any information about operations happening on the other side of a wall at the border of their property- literally feet from their windows- or about the chemicals being trucked in, or of the acids being piped under their homes. Because these sites have existed for decades, they are not subject to environmental review. There is a drilling site in South LA where new owners might try to cap the wells and build affordable housing. Building a medium sized apartment building (50+ units) on the vacant lot would require a lengthy environmental review. But owners of the wells could keep pumping oil close to adjacent residences bedroom windows without having to file a single CEQA document. Our zoning code makes it difficult to establish new oil drilling districts. New districts in urbanized areas need to be at least 40 acres in size; applicants need rights from property owners to drill under at least 75% of the proposed district; and the number of wells allowed in each new district is strictly limited. But again, existing wells in existing districts are not subject to these limits. Old permits don’t reflect current research on health impacts nor the state’s recent emphasis on protecting residents from multiple, overlapping sources of pollutants. Based on the nature of the potential harm from air emissions, noise, spills etc, what types of regulatory approach would best protect public health? Should LA use zoning rules to ban wells near sensitive receptors (locations like residences, schools and hospitals)? Try to work with state and regional regulators to place stronger standards on oil production? Or both.. Amortization means a phase out of uses that have been grandfathered in but that are currently banned. The term sounds financial because the length of the phase out is often set so as to allow the owner to keep operating long enough to recoup some or all of their initial investment. It is obviously legal to apply new and stronger regulations to existing businesses, but when an existing use is severely restricted or banned on a site, questions arise on whether this is a “taking” that the government must compensate the owner for. If LA sets a very short amortization period it might be vulnerable to lawsuits from well owners. If it sets a very long phase out, it would fail to protect residents’ health. The fact that most drilling sites in the city are decades old would seem to suggest that a more rapid phase out would be fair. In 1957, LA’s chief zoning administrator testified: “If we planners had our way, we would prefer that oil drilling and production be excluded from urban areas, especially residential sections.” Unfortunately, his next word was “However…” and he went on to talk about valuable ‘natural resources’ and ‘black gold’ and how residents of the LA region as drivers used gallons of gasoline every day and so needed a steady supply of oil. While many Angelenos still drive and buy and use plenty of gas, the city and state are trying to reduce greenhouse gas emissions and rectify environmental injustices. An outcome that safeguards public health and reinforces our commitment to combating climate change would also signal that we can plan with 21st century priorities. For more information on efforts to regulate urban oil drilling in LA, you can contact STAND-L.A, which is a coalition trying to end neighborhood drilling. LAplus is not a member of this coalition, but we are interested in good rules that support health and sustainability. In many cases, shaping a more livable and sustainable city will require paring back LA’s outdated zoning rules to remove barriers to development that can provide Angelenos with more housing, more walkable communities, and opportunities to try new ways of living and working. In the case of oil drilling, however, the City needs stronger regulations. Active oil wells and healthy families do not seem like compatible uses. In the first installment of a thought exercise on ‘planning LA better,' I suggested that more should be done in City’s general plan to map areas where growth or larger buildings would be encouraged and places where lower-rise structures and/or preservation of the existing built environment would be prioritized. Then community plans could fill in the details. In this follow-up, I want to suggest how a new zoning code could reinforce this kind of hierarchy of citywide and local planning priorities. Los Angeles is currently revising its zoning code, which was last comprehensively updated in 1946, through a process called re:code LA. Background on the project and a summary of work through spring 2016 is available in this presentation. A short summary of LA’s existing zoning is here. I serve on the Zoning Advisory Committee to the re:code process, which is a group of stakeholders that give early feedback on drafts. (We don’t have any formal power, and don’t take positions as a committee). It’s important to note that re:code LA is not rezoning the city, not changing the zoning maps that show what is allowed on specific pieces of land. Rezoning is considered to be planning, and is primarily done through community plan updates. Re:code LA is meant to provide new zones and zoning tools to be used as LA’s community plans are updated. You can think of it as a tool kit for planning, plus a modernized set of land use rules. The proposed structure for the new zoning code is a four-part framework under which each piece of land would be defined and regulated for Context, Form, Frontage and Use. Context is meant to identify the ‘character’ of an area/neighborhood, whether it is downtown, suburban, rural, etc. Re:code hasn’t released a draft set of contexts but I believe that staff are thinking of approximately 6-8 contexts, which could include natural conditions like coastal or hill areas. Context wouldn’t necessarily have any rules linked to it, but would be a package of different form districts/ frontages and uses that make sense in that context. (For example, the downtown context would include form districts that allow taller buildings than form districts in a rural context; but you could in theory have a ‘suburban towers’ form district in a suburban context to allow diversity within contexts). But I do think that context can be meaningful in planning. There are some places where it may make more sense to have more density and growth because they are better served by transit, or because the topography is more favorable, or because they already have a built-up business district and residential population. Context also incorporates some of the ideas of the planning ‘transect,’ which is the new urbanist notion that planning and zoning should reflect the general rural to urban gradient that exists in many places. Form is meant to regulate the “allowable development envelopes for buildings”- in other words, the location of structures and parking on a lot and the size and shape of structures. Re:code’s first adopted zones, 16 R-1 variation zones + one overlay zone, were designed to address perceived problems with ‘mansionization.’ They show many of the zoning tools the city plans to use to regulate form. These include minimum lot size, maximum lot coverage, minimum setbacks (front, side and rear as well as angled encroachment planes), maximum height, and maximum floor area ratio). Re:code’s thinking on zoning for downtown Los Angeles showcase some additional form tools that might be used in a more urban setting: build to lines (basically maximum setbacks) and step backs to encourage podium tower forms. Frontage regulates how the site and structures on it “address the street.” The new code could control minimum transparency, the minimum height of ground floors, whether and where pedestrian entrances are required, and other building features like porches and overhangs. Use refers to what types of activities are allowed on the site. Re:code LA is attempting to organize the almost 2000 uses recognized in LA’s zoning code into a smaller number of categories. Each zone would allow some categories of uses automatically, allow some underlimits by special approval, and ban others. I think that the work done by the re:code LA team is valuable and long overdue. They evaluated existing buildings and neighborhoods in LA and have suggested a zoning system that can be applied to a wide range of contexts. I like that form districts are separate from uses: it allows form and use packages to be mixed in a variety of ways. For example, form could mandate detached structures that look like suburban houses or small apartments, but allow some commercial and retail uses like corner stores to make an area more walkable. I also like that frontages are highlighted as an important component of the code, because the city does have an interest in encouraging a positive interface between private buildings and the public right off way. I also have a few major concerns with the re:code system in its current shape (recognizing that it is not done yet.) One issue is that it may be hard to be a toolkit for future planning while drawing mainly from existing plans(that is, the city’s mainly out-of-date community plans and specific plans.) The zoning code is supposed to implement plans and needs to address existing zoning. But the code is also a kind of language of what it is possible to plan. While planners can develop new zones with new names to meet new goals (as, for example, they are doing with a "new industry zone" for the proposed Exposition Corridor Draft Neighborhood Plan), residents will also naturally look to existing zones to guide their thinking of what types of rules they want in different areas- and what type of city is possible. If the zones in the code are limited, so too may be the public’s sense of possibility. We see this risk in the new R-1 zones, which were drafted to implement City Council instructions to preserve existing“character” and scale. Let’s assume that the new zones meet this goal. The problem is that as we move forward to update community plans, residents of areas zoned R-1 might naturally assume that these zones- which range from a somewhat bigger barn shaped building envelope to a more constrained/ preserving barn shaped building envelope- represent the full set of options before them. Where is the zone that allows detached homes to become attached row houses? The R-1 zone that allows small commercial and retail enterprises? The hot climate zone focusing on courtyards, thick walls, windscoops etc rather than setbacks and parking? The single unit to small apartment zone that takes mansionization as a market signal to allow four-plexes rather than to limit the size of one unit homes? Re:code should develop and showcase zones for future planning that go beyond typical existing ‘character’ Since the build environment is constrained by existing zoning, it seems to me that updating zoning carries with it a duty to show that other types of urban design and forms are possible if we change the rules. Gerhard Mayer recently wrote about two successful building types that are rare in LA- attached row houses with rear gardens and perimeter apartment blocks with interior courtyard. If we don’t point out the possibility of buildings like these, including by having zones that allow them, we limit our ability to plan. In addition to a toolkit, re:code discussions have sometime used the metaphor of a zoning code as a palette. If we only offer beige and gray paint, no matter how many shades and nuances of beige/gray exist, we will still end up with a bland city. So I hope that re:code LA includes and showcases a better balance of zones suggestive of both preservation and evolution. I also worry that a system allowing a profusion of too many potential zones will bias planning towards replicating existing patterns. Re:code’s four components allow fine tuning, which can be useful for important goals like encouraging inviting frontages. But this structure with “44 Form Districts, 21 Frontages, and 36 Use Districts with more to come” (not to mention at least a handful of contexts) multiply out to tens or hundreds of thousands of zones. There will be a temptation to use this system primarily to require conformity with existing buildings and existing relationships between buildings. Preservation and "fitting-in" are sometimes valid goals, but in my mind, a code for the future shouldn’t be about how we built or lived in the past. It should facilitate different ways of living, allow a city with enough homes for all, and encourage experimentation to advance sustainability, walkability and other goals. I would suggest that a variant of the re:code system to reduce the number of zones in LA rather than multiply them might be a better fit to allow the City to set and meet planning goals. What if the contexts - the main categories of urban form/ activities/ locations- became the zones? Contexts could do most of the work in setting form and use rules. These contexts could be set in the citywide general plan. Community plans would fine-tune the context zones, by for example, choosing from a small set of height limits and/or frontage features. A code with ten or so zones and some levels or settings within the zones could draw inspiration from zoning systems used in Japan and Germany, which each have around 10-12 zones and encourage more mixed use development and less costly housing. LA’s own pre WW2 zoning codes, which arguably encouraged or at least allowed development of some of the most walkable and best designed parts of the city, also relied on a small number of zones. The 1930 code had 8 zones, the 1921 code had just 5, and the city’s proto-zoning residential and industrial districts passed 1904-1910 had the equivalent of 2 or 3 zones. Simplifying the zoning code is a natural fit with other good planning objectives, including eliminating parking requirements; reducing some of the exclusionary aspects of zoning that linger from its association with private subdivision; and allowing more housing of all types at appropriate scales. This proposal also relies mainly on maximum height and lot coverage to regulate form. The following chart with a first draft of a simple zoning code with seven base zones linked to LA’s contexts is an effort to explore how zoning could help implement a citywide plan and allow some choice though community plans. This simpler zoning code option is just a starting point, and not an official LAplus proposal. It may be missing important pieces. It may still be too wedded to traditional zoning. It may be possible and desirable to ‘shrink’ it even more. 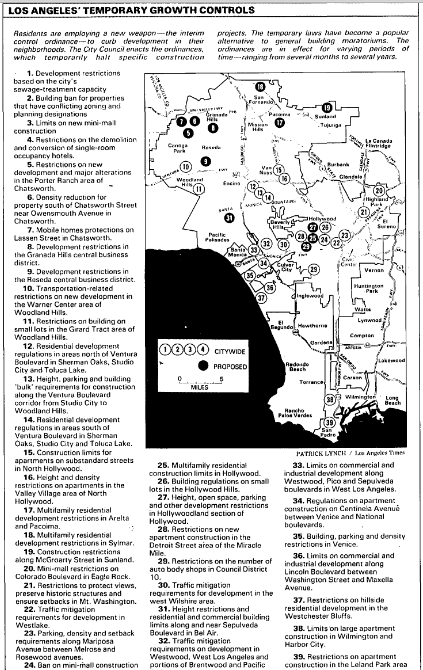 Noting that “planning is [temporarily] hot” following the defeat of measure S, the LA Times recently editorialized on “the need for a new comprehensive vision for how Los Angeles should grow.” With what is probably the right mix of cynicism and optimism, the editorial provides a summary of the Centers Concept from LA’s initial 1974 general plan and 1996 Framework Element that represents thecurrent vision for growth and development in LA. Picking up the optimistic view on this beautiful, sunny day, let me walk through a thought experiment on the Times' challenge that “Angelenos are open to a more urban city. So it’s time to take pulse of the residents again and start writing better guidelines for the future L.A.” What could we imagine as a 2020 vision for growth and development in Los Angeles, intended to positively guide the evolution of the city through midcentury? Before dismissing this as wishful thinking, it’s worth noting that components for (potentially) better planning have been falling into place. When LA City started its process to update its zoning code 3+ years ago, it was seen as creating a more modern toolkit for planning. But LA was totally stalled in writing new plans, which seems to defeat the point of re:code LA. Last year, however, the city quietly launched OurLA2040, an update of the General Plan. This month, city council passed a motion to update all 35 community plans within 6 years, then on a 5 year cycle. So Los Angeles seems to be on track to update its general plan, its community plans and its zoning code. The update won’t happen as one completely unified planning program; but at least these processes are on overlapping time frames and planning staff can coordinate. This diagram shows, in a somewhat exaggerated way, how LA could plan more at a citywide level by making the big decisions about where to allow growth and density and change in the general plan. Note that the goal is to intentionally reduce local control over some decisions with citywide and regional implications. Why? Isn’t local control more democratic? Well, yes and no. The history of LA’s community planning era suggests that the main outcome of decentralizing planning and zoning decisions were downzonings, rising housing costs, and sustained inequality and residential segregation. Would LA residents, who probably care most about land use in their immediate surroundings, welcome planning that shifts more decisions away from community plans (& reduces the soft power of city council members and neighborhood councils)? Maybe if they believe that better citywide planning could shape a city that works well, because it aligns growth and transit and creates more homes and encourages a more sustainable city. Anyway, since this a thought experiment, I will table the politics for now. As the LA Times oped reminds us, the initial citywide vision was an archipelago of high-rise and mid-rise centers, linked by mass transit, in a suburban sea. When this concept was developed, the region lacked rail transit, but we now have an expanding system of subways, light rail and BRT, so there may be components of this vision worth pursuing. It allows those who embrace cities as urban and those who like LA’s low-rise form (in image or reality) to see themselves in the city’s future. On the other hand, this concept in some ways represents a less diverse Los Angeles, the marriage of downtown commercial developers and slow-growth homeowners. And a vision with just a sprinkling of growth areas is vulnerable to campaigns to block new centers. The 1990s update, our current framework element, downsized and more widely distributed the centers to some extent. It sought “the retention of the City's stable residential neighborhoods and proposes incentives to encourage whatever growth that occurs to locate in neighborhood districts, commercial and mixed-use centers, along boulevards, industrial districts, and in proximity to transportation corridors and transit stations.” Like the centers concept, this framework to focus growth (in just 5 percent of the city,) primarily along commercial corridors, had strengths and weaknesses. It fits with LA’s nature of a city of boulevards, and recognizes the diversity of transit and the potential of underutilized industrial and commercial areas. On the flip side, the corridors-focused framework treats growth and change as a problem to be contained, and so seeks to freeze the vast majority of the City in its present form. It also allows new housing mainly along noisy and polluted main streets (or near freeways), contributing to the health challenges of living near traffic. If we think of good mid-rise cities, they will have mixed-use buildings along their main boulevards, but much of their good design and walkability comes from also allowing mid-riseand mixed-use buildings on the side streets. This creates more complete districts rather than lines of density through expanses of low-rise homes. What is a modern citywide vision for LA? Learning from our two past overarching visions, it is probably right to think of a city with high-rise, mid-rise and low-rise areas, with density linked to transit capacity and existing commercial hubs. To go beyond the limitations of these past models, I would suggest that more of the city should be allowed to evolve. That’s what cities do. • Urban areas with medium density and height linked linked to the width of streets. • Suburban diversity (low-rise) areas with traditional single family detached homes but also diverse types of low-rise homes and small shops. • Suburban preservation (low-rise) areas with more restrictions on change. • Natural areas where we want to protect, repair and improve the relationship between LA’s natural environment and how we inhabit the city. Once the citywide general plan maps these (or similar) categories of land use, updates of the City’s 35 community plans would help specify the precise zones in these areas. What is key is that the community plans would choose from among a narrow band of density/ urban form zones; these would be subcategories of the big picture areas mapped by the general plan. For example, maybe there would be a choice of Metropolitan Center, with no height restrictions and regional center with some density limits. For the Urban category, LA might have boulevard and side-streets urban zones, or maybe there would be 2 or 3 ratios of building height-to-street width to choose from. The point of limiting the choice of underlying zoning would be prevent the intent of the citywide plan to become subverted/ diluted by local tendencies to wish that growth only be allowed in someone else’s back yard. PS- planning isn't just about regulating land use and density and housing... it can and should focus more on beneficial public spaces and infrastructure. So just a note that this post focusing on planning via mapping/ zoning doesn't mean that this is the only or best way to plan and to regulate. As LAplus begins to explore ways to inspire and advance the LA region, land use planning is an obvious early research focus. Planning touches on so many aspects of life and potential: sustainability, participation, housing, health, mobility, development, etc. We take it for granted that land use planning takes a certain form: that the main tool of city planning is zoning and the main process is community meetings to seek feedback on individual proposed developments and local plans. But are we planning at the right levels, for the right things, with the right tools, and in ways that engage our diverse residents? A. Why do we plan? Do we plan too much or too little? To kick off thinking about how we can plan effectively, it’s worth remembering that we plan private land uses and places in a much more direct way than we plan other sectors of the economy. Is this a positive step towards economic democracy, or a flaw in urban planning? What are justifications for planning? Are there ‘anti-planning’ sub-currents in urban theory and architecture? Does planning reinforce, duplicate or undermine other regulations, pricing strategies and other methods we have to shape cities? B. What type of planning is LA required to do? California requires cities to have a general plan with certain elements, and the City of Los Angeles has chosen to divide its required land use planning into 35 community plans. What has to be in these plans, what additional issues has LA planned for, and what flexibility is there within the state requirements? C. Can we plan regionally? LA puts the teeth of its planning- zoning- in community plans. What are the benefits and limits of local planning? Is it possible to ‘invert the pyramid of planning’ to put more rules and guidance at the regional and citywide level? Ironically, LA City’s first state-mandated general plan was based on a regional vision of centers linked by transit- and the city mapped out potential centers beyond its municipal borders. I’m interested in looking at metropolitan areas- like Toronto- that plan regionally and take some of the decision-making power over local projects out of the hands of local decision makers. D. What is a citywide vision for LA? The City of Los Angeles is updating its general plan through a process called ourLA2040. With components addressing public infrastructure, sustainability as well as growth and land use, can this provide ‘real planning’ for LA? Can more decisions be made at the city level to guard against the natural tendencies towards parochialism and exclusion that surface in local planning? E. Can community plans accommodate growth & housing? The chief legacies of LA’s community planning era has been aggressive downzoning, stubborn inequality, and a housing shortage with tragic consequences. Whether we continue to regulate land use through 35 community plans or consolidate planning at a higher level, how can we make sure that there is adequate capacity for new housing? F. Do we over-plan private property and under-plan public assets? Last year one of my LAplus co-founders, Mott Smith, and I argued that LA ineffectively attempts to micromanage private land while missing opportunities to productively guide the evolution of the City by planning and providing infrastructure and public space. I’d like to look at both sides of this equation - the private and public spheres - in more detail. G. Should we rethink zoning? Los Angeles was a pioneer in zoning for use and our current zoning is a mishmash of motivations and patchwork of policy concerns related to incompatible activities, exclusionary politics, and aesthetics and ‘neighborhood character.’ The City is fully revising its zoning code for the first time since 1946 through re:code LA. Do we still need zoning? If so, should Los Angeles’ zoning be made more customizable, with flexibility to cover local concerns and neighborhoods? Or is there a way to simplify the zoning code to address a few key goals? H. How can planning be democratic and effective? Traditional planning meetings are frequently criticized for excluding most residents, especially low income residents and renters, for limiting input to feedback on predetermined frameworks, and for empowering opponents of change. Are there better methods to involve the public in creating a vision for the future and to channel participation to aspects of the city’s future that plans can actually shape? I. Can CEQA be reformed? The environmental impacts of many urban plans and planning decisions are interpreted through CEQA. Is this law, designed to be skeptical of some human actions that threaten ecosystems and scarce resources, the right tool to analyze the lot by lot evolution of cities or installation of modern infrastructure? What exemptions or reforms to CEQA would facilitate the positive environmental impacts of urban change, and do we need a new generation of environmental planning laws? Local politics in Los Angeles over the last two election cycles has been dominated by questions of planning, housing, transit, homelessness, growth and change. These issues have long been at the heart of urban governance. When LA voters overwhelmingly approved Proposition U in 1986, which downzoned much of the City of Los Angeles, its anti-development advocates declared it the “dawn of a new era.” (LA Times, Nov 6, 1986). Thirty years later, we have this measure to thank in part for 3% vacancy rates throughout the city, higher rents and increased homelessness. It is too soon to tell if the emphatic defeat of Measure S represents the passing of the slow growth generation and the dawn of.. something else. What is clear is that almost no one is satisfied with the status quo on planning, housing and related issues. LAplus is keenly interested in post-measure S conversations, research, policy making, prototyping and other creative efforts to inspire and advance LA’s positive urban future. That’s our mission. It’s why we created LAplus. As a brand new organization, we have mainly been in planning and conversations mode ourselves. We stepped forward from our soft launch to collaborate on No on S, Yes on LA. Now that voters have said No to S, what can residents and stakeholders imagine and advance as a “Yes to LA”? LAplus sees our role as helping illuminate some of the rules and attitudes that have held back the positive evolution of the region, and in exploring and advancing potential reforms: new ways forward. Before we advocate, we want to look deeply at existing systems, rules and assumptions. We are developing an outline for inquiry: a post-measure S research agenda. It covers four critical and interlinked topics and systems that we believe are crying out for reexamination, and in some cases, reform and reinvention. These are land use planning, housing, urban innovation (which includes urban design and sustainability), and equity. A post on planning provides an initial set of issues for inquiry. They are presented in question form rather than as answers because we while and other stakeholders have ideas on what changes are needed, we want to look more deeply at what works and what doesn’t- and to acknowledge trade offs and uncertainty. In considering areas for potential reform, I tried to frame questions through the lens of LAplus’ mission, and our values. First, we want an open city. This means that Los Angeles should welcome and support all types of residents old and new, allow enough homes for all who want to live here, and be open to change and innovation. Second, we want to empower more people and organizations to be city builders. This means that barriers to different types of ownership and development should be reduced. Our byzantine, years-long development process requires owners to have lots of money to pay for consultants and the costs of holding land while seeking permits. We want good rules and simple, quick processes. Third, we want reality-based rules. We like magical urbanism in our literature and art (and in encounters & contingencies of daily life) - not in our policy. this means that rules should be based on evidence, not wishful thinking (with all the appropriate caveats that people are more motivated by stories and by values than by data). We will use this blog to post research-in-process on possible reforms. Nothing posted here should be considered LAplus’ formal positions, unless we clarify that we are taking a stand. Please also reach out at hello@la-plus.org if you would like to talk about any of these topics or collaborate on research! If there was a famine in California and people were starving, would we ban farmers from planting additional crops? That’s what Measure S does, but for badly-needed new homes. As an organization working for a better future for Los Angeles, LAplus is interested in good rules and in empowering more Angelenos to help shape the city. But urban policy- like medicine- needs to follow the principle- first, do no harm. In measure S, on the March 7, 2017 ballot, Los Angeles is facing a serious threat to its openness and prosperity. We wish that our kick-off blog post could explore positive visions for LA and rules to help us get there… but let’s defeat Measure S to ensure there is space for positive change. LA has a severe housing shortage, Measure S would make it worse by banning thousands of affordable and market-rate homes and even blocking permanent supportive housing for the homeless on city-owned land. The types of developments that Measure S would block are 'low-eviction projects' because they tend to be built on parking lots or under-utilized industrial sites. Measure S gets in the way of LA's evolution to become a more sustainable city by stopping housing near transit, smarter use of land, and more energy efficient new buidlings. At a time when LA needs to resist nationalism and fear, Measure S would make it harder to make space for diverse residents. Measure S, sponsored by a healthcare executive who has spent over $4.5million because a new building in Hollywood might block his views, would amend city rules around planning and zoning. The two key changes would be to permanently ban general plan amendments except for large sites of 15 or more acres; and place a two year moratorium on zone changes that allow bigger or taller buildings or allow more intense use of land. What does this matter? LA has many out of date plans (and even for newer plans, it’s not possible to perfectly predict what should or should not be allowed on every one of the more than half million individual pieces of land in the city). As a result, land owners often seek zone changes and/or general plan amendments for many building projects. These tools allow parking lots, abandoned auto dealerships, and run-down industrial buildings to transform into hundreds of new market rate and affordable dwellings. Measure S also makes it harder for planners to reduce the number of parking spaces required for new buildings or new businesses in existing buildings. Why would this hurt LA? Los Angeles has a severe housing crisis. One of the main causes is that not enough housing has been built in the city and region in recent decades to meet the demand from a growing population. This under-building has led to ultra-low vacancy rates that let owners charge high rents. In fact, LA is considered the best market in the nation to Own apartment buildings, because we have a shortage or rental units and because we make it hard to build new homes. Remember, stopping new housing helps landowners, not renters! The housing shortage cascades down to inflict real suffering, from homelessness to high rents to overcrowding and displacement. More than 25,000 people in the City of Los Angeles are homeless. 60% of LA households are “rent burdened” under the federal definition of spending more than 30% of their income on housing, and a third of residents spend more than half of their income on rent. Over 20,000 rent stabilized apartments have been lost since 2001, with households evicted from most of these units. There are approximately 50,000 unpermitted second units on single family houses properties in LA city and thousands more unpermitted living units in apartments and industrial sites. Nearly 100,000 households live in severely overcrowded conditions and another 100,000 in overcrowded dwellings. Between 2006 and 2014, 350,000 young people in LA County delayed forming their own household due to high housing costs. LA is 3rd in the nation in the percent of Millennial residents who moved out of the area in the past decade. Measure S supporters claim that LA doesn’t need new housing because most new homes are market rate/‘luxury.’ But an increasing number of deeded affordable units would be blocked if Measure S passes. Measure S includes an exemption for 100% affordable developments- but only from the two year moratorium on zone changes. This is a phony exemption because it does not cover the permanent ban on general plan amendments. We have calculated that there are 2455 units of affordable housing that would need a zoning change or a General Plan Amendment proposed in Los Angeles over the past 5 years. Of these, 95% of it would be blocked by Measure S. In addition, most of the city-owned sites planned for housing for the homeless under Measure HHH would also be permanently banned because they need General Plan Amendments. Finally, because developments that Measure S would block include large buildings constructed on underused and empty land, stopping these projects would increase evictions and displacement. Here’s why. Many displacements in LA are in older apartments, with owners using the state Ellis act to legally evict tenants. The ratio of new units to demo'd units for Ellis act evictions is very low: 2-1. This is because most Ellis act evictions are to upgrade units and/or bring in new tenants to charge higher rents. These evictions don’t need or use zoning for general plan changes to create larger structures. By comparison, the average development in LA has a 5-1 ratio of new to demolished units- think of a small apartment replaced by a somewhat larger building. And the type of developments that Measure S would ban lead to few evictions. This is because changing zoning change and general plan designation unlock entirely new uses and scales of construction. You can think of the projects that Measure S will ban as providing a LOW-EVICTION ESCAPE VALVE for LA's housing demand. Get rid of this outlet and evictions will likely go up significantly. The evolution of the city can allow LA to adapt to climate change, new forms of mobility and new industries. For example, the City of LA is planning to source more water locally and reduce per-capita consumption of water; increase local solar power generation and energy storage; reduce energy use per square foot in buildings by 30%, cut greenhouse gas emissions by 80%; create many more green jobs; install cool roofs and shade; and reduce asthma cases in low-income communities to advance environmental justice. Researchers at UCLA have mapped out more aggressive goals to achieve 100% renewable energy and local water sourcing and better integrate natural landscapes into LA’s built environment by 2050. Many of these new, more sustainable systems will be created lot-by-lot as buildings are remodeled or constructed. Measure S would slow this process and undermine public investments by freezing many developments and prioritizing letters on zoning maps over real world improvements. As LA Times Architecture and urbanism critic summarizes Measure S, it part of a thirty-year old battle by slow-growth homeowners to preserve an outdated version of Los Angeles. LA is a big place, with room for many ways of life and different urban forms. Don't let the 'haves' freeze the city when we need to be imagining and creating a better place for all residents. In assessing Measure S, we also can’t ignore the times we live in and the national political climate. At the Federal level, our leadership is slipping towards nationalism, protectionism, fear of migrants, and nostalgia. Especially at a time when the federal government is seeking to target immigrants and build a physical wall, we need our progressive cities to be welcoming places for all. Los Angeles’ strength is its diversity. LA is home to people from many backgrounds, a mix of longtime residents and newcomers, and welcomes tens of millions of visitors annually. Over 70% of residents of the City of LA are non-white; 37% of residents were born outside of the U.S.; 60 percent live in a household where a language other than English is spoken at home, at least 185 languages are spoken in LA. Despite the challenge of pricey housing, LA city’s population grew by 50,000 between in 2015 to surpass 4 million for the first time. 47.3 million tourists/ visitors traveled to the city of LA in 2016, the most ever. Los Angeles’ reputation and ethos is as a place where people come to pursue their dreams. Measure S threatens this openness and diversity by blocking new housing and smarter use of land.